First off, I want to say that I did not travel to Madison, Wisconsin, looking for a story about food. 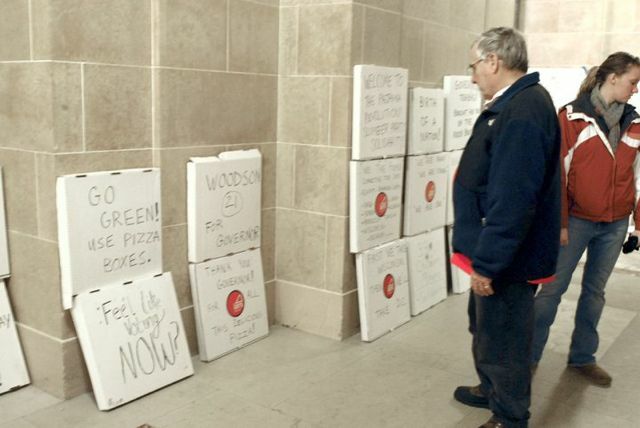 I went there to protest a bill that I believe hurts a lot of hard-working, good-hearted people in my state. If you are interested in the particulars of that issue, there are hundreds of newsmagazines that can help you out. I suggest the Journal Sentinel. Where my brain, mouth, arms, and feet go, however, my stomach must follow. Otherwise, I would have made my stomach stay home and take care of the dog while I marched in Madison. Since mid-February, over 100,000 stomachs have encircled our capitol building. They have filled its rotunda amid chants, drums, bagpipes, cowbells, and horns; they have wandered its ornate, neoclassical galleries on the second and third floors, and counted the Mylar balloons stuck to its vaulted ceiling. If these stomachs examine the second-floor galleries, they may be surprised to find volunteers staffing medic stations, an impromptu lending library, massage chairs, and a small mess hall. Yes, a mess hall. I don’t know if anyone has actually analyzed the number of calories protesters burn, but speaking from personal experience, I can identify three significant factors that surely increased my Madison calorie expenditure: it was around the freezing mark outside the Capitol, my back hurts when I stand in one place too long (which means I walk frequently), and my sign was a little lopsided and heavy. Ergo, after about three hours, I was pretty hungry. Wasn’t it Napoleon who said that an army marches on its stomach? In that respect, he was a smart man. The mess hall was a group of tables laden with a shifting array of bagels, spreads (including a four-gallon tub of cream cheese that was nearly empty when I showed up), fruit, juice, tea, water, and carrot salad. Hand sanitizers and admonitions to keep grubby mitts off the baked goods were everywhere in evidence. A helper stood at each table distributing napkins and reminding people of the ground rules: Wash your hands, take only what you need, and throw nothing away. 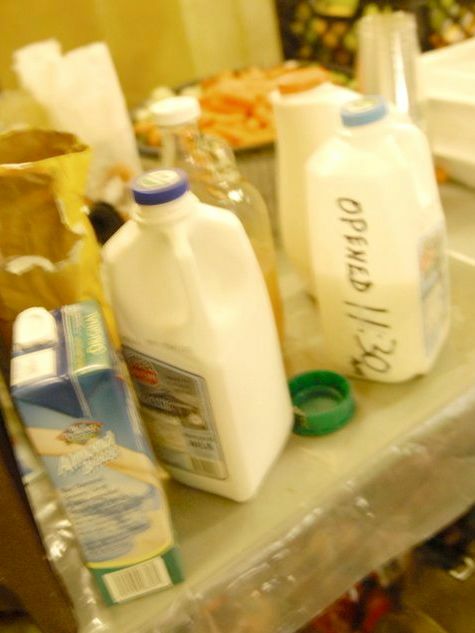 To avoid spoilage and illness, the milk jugs were labeled with the time they were opened. Waves of people approached the tables, everyone following directions and taking a small parcel of food. At noon, delivery personnel from Ian’s Pizza, Pizza Hut, and Subway came bounding up the walkways with food donated by well-wishers from around the state, nation, and globe. 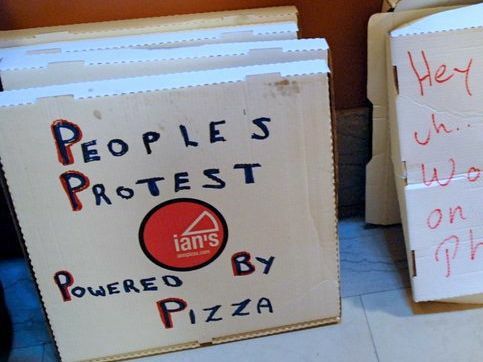 Ian’s Pizza was the early adopter in this trend; a ways from the food area, an entire hallway is devoted to a pizza-box recycling project that turns their boxes into signs that can be carried into the marches. Outside, more volunteers handed out water and hot dogs. 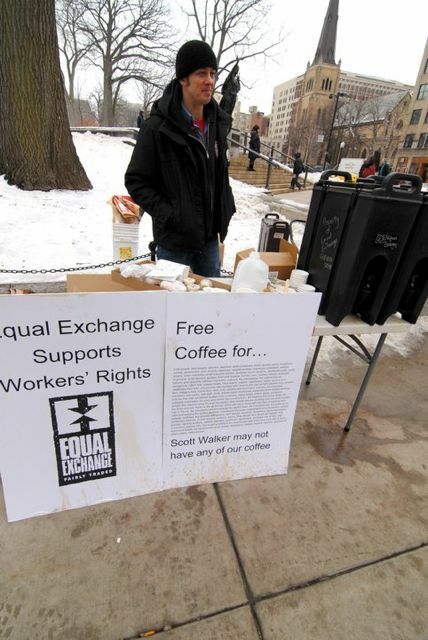 At the State Street entrance to the Capitol grounds, a worker from Equal Exchange offered bagels and coffee to protesters. Words of gratitude flowed from the people filling their plates and mugs. Since the protests began, pundits have voiced worries about violence, especially as demonstrations surged into a second week. I can only report my own experience, which was completely benign and orderly. Even the police officers assigned to monitor the protesters commented on the good behavior of the crowds, day in and day out; some said they requested the Madison assignment because overseeing protesters was less stressful than their daily beats. The atmosphere of care in that building, which is most readily symbolized by the availability of food, has shaped this protest. When a community recognizes and honors its members’ basic needs, and when everyone finds a way to meet those needs, good things happen. 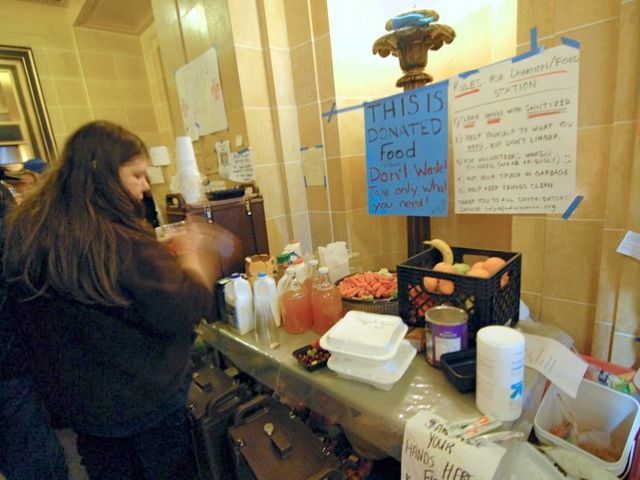 Groups like the Working Families Party, one of the food-table sponsors, understand that. There is a model and a lesson in the little village that has emerged inside my state capitol. So maybe politics can be bad for digestion, but on my trip to Madison, it definitely added flavor to my plate. p(blue). All photos were taken by Leah Dunbar.